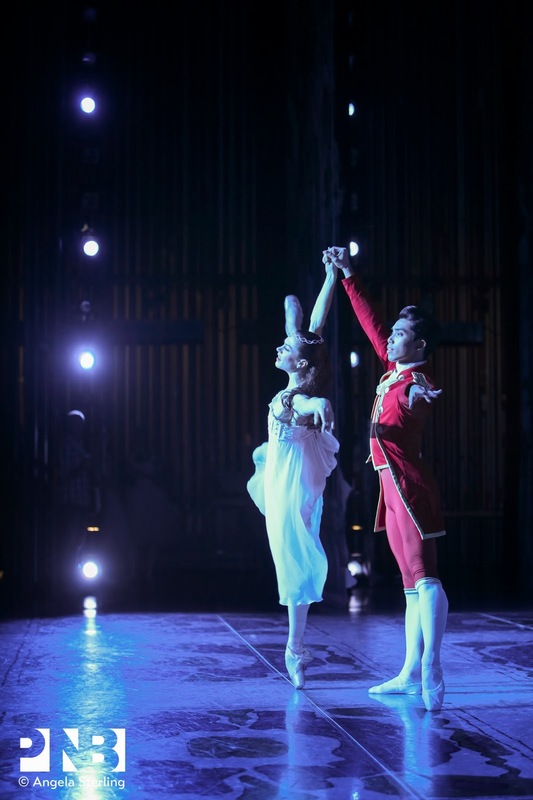 PNB Principal Dancer Rachel Foster and corps de ballet dancer Eric Hipolito Jr. in Stowell & Sendak Nutcracker. Q: Can you even describe for me what it was like to dance this role for the first time? A: It was so much fun…really exciting. I have watched this Nutcracker for so many years now…the whole ballet is such a big part of my life. This role in particular is a dream come true because it’s the first prince role I ever imagined myself doing. Q: How do you feel about your performance? A: It felt pretty solid. I would not go so far as to call it “good”, because it was only my first time and you can never stop improving. But, I tried to portray confidence and present Rachel as best I could. I guess you could say it was satisfying. Then PNBS student Eric Hipolito Jr. as a Fighting Mouse in Stowell & Sendak Nutcracker. Q: Nutcracker is often the first ballet people see. What about you? A: Yeah, my parents brought me to see PNB’s Nutcracker when I was 5 or 6, before I was even in DanceChance. Q: Did they also come and watch your debut in this role? A: My mom and my dad and my sister all came. My extended family will come see me perform other roles in other shows this year. Q: Are there any roles you used to perform when you were younger that you miss now? A: The Chinese Tiger! I loved watching that part as a kid and I loved performing it too. It’s so much fun! Eric Hipolito Jr. as an Officer in Stowell & Sendak Nutcracker. Q: Principal dancer Rachel Foster danced the role of Clara with you. What’s it like dancing with a senior Company dancer? A: Well, I think Peter [Boal] pairs us together often because of our size—height really matters. Plus, we have danced together in other ballets—Concerto DSCH and Brief Fling. It’s pretty common for someone like me who is new to partner someone who is more experienced and proven in a particular role. Q: How about you—how do you see yourself supporting other dancers at this point in your career? A: With other Company dancers we tend to just help each other out. Of course there’s also some friendly competition, but really we’re all growing up together. I really like to encourage other DanceChance kids and Professional Division students. There’s so much talent and potential in these studios. Former PNBS student Eric Hipolito Jr. as the Prologue Mouse King in Stowell & Sendak Nutcracker. Q: What qualities do you think help make someone successful as a dancer? A: Perseverance and self-confidence. Dance is really a mental activity as well as a physical one and you have to be able to stick with it if you want to improve. You also need to be willing to stick with it even if others don’t think you can or should. Q: You’re kind of hometown hero who grew up in Seattle and trained at PNBS. It’s unusual for someone in this profession not to relocate for their career. What’s that like for you? A: Well, it’s what everyone dreams of doing, starting at the bottom and working your way up. Everyone’s seen me grow up here–not just the teachers in the school, but also the stagehands and the costume shop. Many have been with PNB for years just like me. Plus, my parents can come see me in every show because it’s just a 15 minute drive! I just call them when I need something…it’s awesome. I love Seattle and just feel really lucky to be here and dance for this company. Then student Eric Hipolito Jr. at a Party Boy in Stowell & Sendak Nutcracker.